Furnace filters trap particles and gases as they enter the furnace system or as they exit the combustion chamber, depending on where in the heating system they are located. Foreign particles lower the indoor air quality in your home and can potentially damage the furnace if they are not caught by the filter. Install new filters in your furnace according to the manufacturer's instructions. And be sure to get the right size of filter. Furnaces require the proper size of filter, or dust and other particles can damage the appliance. The smallest common furnace filter size is 10 inches by 20 inches, according to the Nordic Pure website. This means that the furnace opening and the filter frame at the blower, which moves air through the ductwork, measure 10 inches by 20 inches. Small filters allow less air to pass through them per minute, so they are generally installed in small homes that don't require a large furnace or large ducts. All filters come in depths that range from 1 inch to 5 inches. One- and 2-inch-deep filters are the most common. A 14-inch-wide furnace will require a filter of at least 14 inches by 25 inches. Installing a filter frame and filter that's any smaller, while you are installing the central heating system of your home, will lead to inefficient heating and problems with the furnace. You may be able to install a filter frame with a different configuration that has the same total surface area. A 18-inch by 20-inch filter should have the same effect as a 14-by-25-inch filter, but not all furnaces have output ports that will accommodate multiple sizes of filter frames. The largest commonly used furnace filter is 24 by 25 inches. 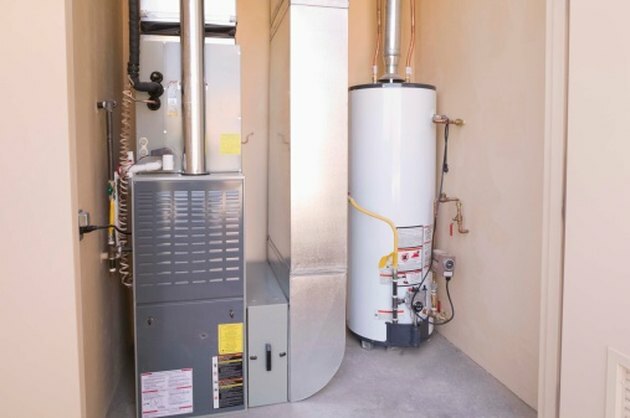 It is required for furnaces that are 24½ inches wide, according to Austin Community College. Larger filters are available in dimensions of 24 inches by 30 inches, but these fit only on the very largest furnaces that are used in multistory homes. Larger filters offer more surface space, which traps more particles that small filters. Sometimes it's impossible to find a premade furnace filter that fits the frames in your heating system. If you've measured the frame and found an odd measurement that doesn't fit any common filter sizes, it's possible to order a custom-made filter, according to the Furnace Filter Care website. Having a filter custom made allows you to request extra layers of material or deeper pleats to trap particles more efficiently.